I hate moving. I hate packing, I hate unpacking, and I hate the entire process. A few years back I swore I would never do a move by myself again, and instead have been hiring guys to help put my belongings in the truck and to take them out at my new place. It has certainly made moving a little easier, but every time I move I have to decide whether to hire full-service movers, to go the “You pack, we drive” route, or to rent the truck and drive it myself. And guess what? It’s time to move again, so it’s time to compare and contrast different moving methods again. This time I am moving from Colorado to California, and while I own a fraction of the belongings I owned 5 years ago, I still have a 1 bedroom apartment’s worth of furniture and “stuff”, so I need something other than a small trailer to tow behind my Mini. So let’s take a look at the three methods of moving I will chose from, and see which one makes the most sense in term of economics and the amount of work involved. I have used full service movers a few times now, and while they are the most expensive way of moving, they are also the least amount of physical work. Some guys come to your house, put everything in the truck, drive it to your new place, and then put everything back in while you just direct them to where. However, doing your move like this can cost a pretty penny, and a quick estimate with a major company for my move ran around $3,500. Ouch. I am not looking to spend this kind of cash right now, so will be passing on having someone else do all the work for this move. 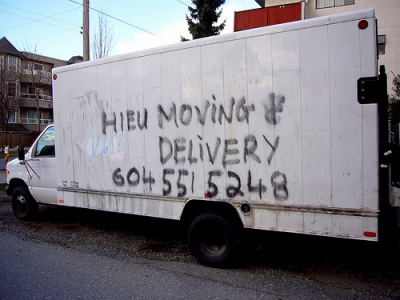 Truck rental – $640. I have 5 days to pack, drive, unpack, and return truck. Move – $1,013. I have unlimited time to pack and unload the truck at my homes. So, for a minimum savings of $323, and a lot less headache (I have towed a car behind a truck before, it’s not fun, especially over the Rocky Mountains), I think I have found out how I am going to move this time around. What method do you use when you move? I hope this goes smoothly, and I am hoping this is the last move I do for quite a while. The last few years has been a whirlwind of packing and unpacking! Hi David, I really enjoy your posts. I’ve moved cross-country 2 times myself, with 2 completely different methods: The first time, I drove my car and my father also drove his truck, and bought a trailer just for the purpose of moving my stuff. When we arrived at my new home, we unpacked, and my father took the empty trailer to a place that sold them, and sold it on the spot for the same amount he paid for it (and we were rid of it the same day we unpacked)! The second time, I didn’t really care to keep the stuff I had (am quite minimalist myself), so I sold everything on Craigslist and moved back with only what I could fit in my car. I plan to make a large move again in a couple of years and will probably do the same thing. Best wishes on your move! It sounds like that $323 will be well worth the reduced stress. That’s money well spent. If I am moving in town, I do it myself and get friends to pitch in. I’ve also moved across the country and to/from Mexico. In those situations, I sell all my things. It’s just not worth lugging it all around. I also believe it affirms that I will have to means to replace those items if I want to in the future. I don’t want to operate from a fear-based scarcity perspective. Having someone pack for you is well worth the money because it can releive a lot of stress. You already have enough stress with everything else. If you don’t have a lot of stuff, I think the cheapest way to move across the country is UPS. Just box everything up, call them and they will come pick up your boxes. I moved across the country once for about $300.